For most IVF patients, seeing your own embryos is an emotional high point . This is the climax of the IVF treatment and represents the culmination of what modern assisted reproductive technology can offer today . It allows you to actually see that your eggs have fertilized , which means everything is working properly ! When your doctor is ready to transfer your precious embryos back in your uterus , this can be an extremely touching moment . It reinforces the fact that you have received good quality treatment and are on the path towards achieving your goal of having a baby . Patients can get very possessive about their embryos and they start thinking of them as being their babies - which is why many patients will refer to their embryos as embies on a lot of bulletin boards. However, the sad fact still remains that embryos are not babies. The limitation of our technology is that while we are good at making embryos in vitro , we still cannot predict which embryo will become a baby. This is true for multiple reasons, the primary one being is that while making embryos in the lab is within our control , after we transfer the embryos back into the uterus , we have no control over what will happen next. After the transfer , the embryo then has to implant in the uterus . Implantation is a biological process , which we can try to support with medications but cannot control . This is the reason why most embryos don't end up becoming babies . This is true for fresh embryos and for frozen embryos as well, because they all represent potential babies . Sadly, there’s many a slip twixt the cup and lip, as the old saying goes, and this is a barrier, which we have still not been able to overcome. If your embryo does not implant and your pregnancy test is negative , this is extremely traumatic , because it represents to death of your dreams - and the loss of what were your potential babies. In fact, some women feel that they have killed their embryos when the IVF cycle fails - while others think that a failed IVF cycle is the same as a miscarriage. Neither of these is true. Human reproduction is an inefficient enterprise - whether the embryo is being made in the lab, or in the bedroom ! Even fertile couples take time to get pregnant when they try on their own, so it's hardly surprising that IVF does not have a 100% success rate either. The reason most embryos do not become babies is that they have subtle genetic defects, which we still cannot identify. This is nature's defense mechanism coming into play - rather than give birth to an abnormal baby, it prevents the embryo from implanting in the first place ! Many women are petrified that if they do something wrong after their embryos transfer ( during the two week wait), they will end up harming their embryos and damaging them. This is why some of them will take leave from work and stay at home; while others will fret and fume about whether they are allowed to take any medicines at all after the transfer. A lot of doctors feel it's unethical for doctors to have a website because they feel it is a form of advertising . They feel that a website is a cheap gimmick, and respectable doctors do not need to stoop to such low levels in order to solicit patients - after all, there is a difference between doctors who are professionals and stores, which are out to sell their goods ! They feel it is below their dignity to put up a website ; and will actually look down upon other doctors who have an online presence. My take on the matter is exactly the opposite. And in fact, I feel doctors who don't have websites are actually being unethical. Let's not forget that the word doctor is derived from the word docere , which means to teach ; and that one of the primary professional responsibilities of the doctor it to educate their patients, so that they can manage their diseases and take better care of their health. The medical profession is meant to educate laypeople , so that they can remain healthy and prevent illness . One of the most effective tools to educate patients is a website. It allows doctors to reach out beyond the four walls of their clinic , so that they can teach everyone in the community about their health. By not doing so they are actually abdicating their responsibility . In fact it's the senior doctors , who are no longer actively practicing medicine , and have become the senior statesman of the medical profession , who are in the best position to provide online patient education through a website , because they can provide information which can be trusted . It's sad that they are selfishly allowing a lifetime of clinical experience to go with them to the grave. A lot of doctors are very critical and dismissive of patients who on the net in order to find information about their illness. They dislike patients who google their symptoms , and then bring pages of internet printouts , so that they can discuss the results of their search with their doctor. They feel that the internet just serves to confuse patients ; and ends up wasting the doctor’s time as well. However, if you are not willing to provide an alternative solution, this just means that you are part of the problem. Doctors need to realize that if they were willing to publish their own websites, their patients would be much happier to get authentic reliable information from a person whom they can trust - their own doctor - rather than have to waste hours , hunting for information, which is of doubtful authenticity. Patients don't like wasting their time ; and they hate getting confused when they come across information on different sites, which provide diametrically opposite viewpoints. I hope it will soon become as routine for doctors to have their own websites, as it is for them to have their own stethoscopes ! As an angel investor, I was invited to an interesting conference on Investing in India organised by Violet Arch. The keynote address was given by Mr Subramaniam Swamy , who is a colourful person ! He spoke on - Evolving macro picture in India - greater role of financial and judicial activism. He is a good speaker and provided a lot of food for thought. Western countries are unhappy about the fact that India imposes tariffs and barriers in order to prevent the import of their capital goods . The fact is that they cry themselves hoarse about the importance of a free market, but they do exactly the same thing when it suits their interests . When we try to export labor to them, they prevent us from doing so, by cleverly framing the issue of preventing the export of labor as being an immigration issue. Aren’t both capital and labor tools of economic productivity ? If they want the free flow of capital goods across the globe, in all fairness they should allow the free flow of labor as well. This is the only way to ensure a level playing field ! Interestingly, he felt that just like a personal crisis is good for people because it allows you to grow , the financial crisis is also a blessing in disguise, because it allows us to get our act together. By filing the case in the 2G scam, he’s played a key role in mobilizing judicial activism . While this has been criticized in some quarters as over-reach, his hope is that this can become contagious , and if more people start resorting to this, it can force the political system is to shape up and become better and cleaner. He felt that one of the problems with economic reforms is that the short-term pain these cause result in the reformers losing the election post reform, because the losers vote them out of power. It’s important to keep these political dynamics in mind when implementing reforms, and ensuring that the reforms also provide immediate, short-term gains so that people feel they have been benefited. Being infertile is a major life crisis and can have a huge impact on your life. It's not just the anxiety and the uncertainty of waiting to find out where you're going to have a child – it’s the impact this can have on you as a person. A lot of people find that their struggle with infertility changes their personality. Some people become angry, frustrated and unhappy when they find they can't have a baby. The starts affecting their self-esteem and they get an inferiority complex . They refuse to attend parties , social gatherings and marriages, because they are fed up of having to deal with prying queries from strangers as to why they don't have a baby as yet . They tend to become isolated and socially reclusive. Their belief in their own competence is shaken up because they cannot even perform the basic biological task of bearing a child. As any IVF patient will attest, the 2 week wait after the embryo transfer are the longest 15 days in your life. All the action and the excitement of taking injections , going for scans , monitoring your blood test results and admiring your embryos is now over. Your doctor has put your embryos back into your uterus - and now all you can do is wait for the final outcome , in order to find out whether the embryos have implanted are not. Not only is the fact that the outcome of the treatment completely out of your hands extremely frustrating, what makes it even worse is that there is no way to of finding out what is happening to your precious embryos inside your body. I see many infertile couples who have a very had a wide range of tests done. Some of these tests are extremely expensive , and don't provide any useful information as regards their fertility. These include : tests for TORCH; tests for NK cells ; and testing for TB. It’s very easy for doctors to order a battery of tests - and because patients expect doctors to do tests in order to find out what the problem is , they are quite comfortable with doing whatever the doctor suggests. We got married in May 2002 and after one and a half year decided to start a family. My periods were irregular from the beginning and every month I would think I am pregnant. After further 6 months we decided to visit a gynecologist. A whole lot of doctors ( references from family and friends ) and the numbers of tests for us left us devastated. All the doctors said this is a case of unexplained fertility. Our personal life depended upon my sonography scans and my fertile period of the month. We tried everything later to find each month that I am not pregnant. The internet has become the primary source of medical information for patients and it’s high time doctors acknowledged this. It’s available 24/7, and provides lots of information on all possible topics – some of which is very high quality. Since so many patients are going online, it’s only logical that doctors will follow and lots of doctors have their own websites, where they inform patients about the services they provide. With so many doctors and patients on the internet, it’s only natural that lots of interesting changes are going to occur in the way medicine in practiced. Some of these changes are very positive – for example, the growth of expert e-patients, who educate other patients; and the development of the Health 2.0 movement, which uses technology to encourage participatory medicine, to empower patients. However, as with everything else, the internet can be a mixed blessing – and one of the problem areas is the mushrooming of doctor rating sites. After seeing the success of restaurant rating sites, it’s hardly surprising that entrepreneurs want to exploit this area and the past few years have seen an explosion in the growth of websites which allow patients to review/rate (usually rant or rave ) about their doctors. Patients have always had opinions about their doctor - after all, this is how a doctor’s reputation develops . Traditionally, this was by word of mouth, which was a slow process; and it could take doctors a lifetime to build a reputation. However, while many patients will swear by their doctor, there will be others who will swear at them ! The good news is that most reviews on doctor rating sites are positive. However, the fact remains that some will be negative. How do we deal with this, to ensure that these sites are ethical; and offer a fair deal for both doctors and patients ? Sadly, doctors are easy targets. They have fragile reputations ; and it’s not easy to protect these. This is why some doctors ( belonging to a group called Medical Justice) have taken an aggressive approach; and take a signed consent form from their patients that they will not post negative reviews ! Some doctors are worried that it is not ethical to censor patient’s opinions; but while words like patient autonomy and patient welfare sound very grand in the abstract , when patients bring you printouts of false and unfair things which patients have said about you online, you are likely to respond far more viscerally ! While it’s all very well to take the moral high ground when talking about the right of patients to freely express their opinion about a doctor, I can vouch from personal experience that reading a negative review about you can raise your hackles very quickly. While some of them maybe well-deserved; others are unfair because it’s obviously pended by a disgruntled patient , venting his bile . Others may even be planted by the competition ! Can we censor these sites ? Let’s not fool ourselves – the horse has left the stable . It’s a fact that we will need to learn with patient complaints – including the ones posted online on doctor rating sites, for all to see ! Prevention is better than cure, and you can try to prevent negative reviews by managing patient’s complaints proactively . Sadly, we don’t like dealing with patient complaints , which is why they are often ignored . Even worse, many patients with complaints are belittled or patronised, as a result of which a festering problem just becomes worse. It’s best to treat every complaint as a gift ! Remember that the fact that the patient has taken the time and trouble to complain means that the patient is not planning to desert you and walk off to the doctor next door ! Complaints are actually the best opportunity doctors have to understand the patient’s experience , so that they can help to improve it. In our practice, we actively encourage our patients to provide us with feedback – and both compliments and complaints are welcome . Compliments give us a high and tell us we are doing a good job. Complaints remind us that we can do better . I always tell my patients – If you are happy with us, please tell the world . If you are not happy with us, please tell us, so we can fix the problem ! Patient satisfaction surveys are useful tool which allow you to identify problems and fix them before they get out of hand ! So why do unhappy patients go online to complain ? Most patients are quite reluctant to complain to their doctor face to face . They are worried that if they complain, the doctor may get upset and may not provide them with good medical care. This is why most patients are docile and compliant in the clinic. However, when they leave the clinic, they will then openly criticize the doctor – an unhelpful approach , which does not help either the doctor or the patient ! Ideally, webmasters of these sites should realise how fragile a doctor’s reputation is and how much it means to him. This can actually help them create a high quality site for their users. Firstly, they should ban all anonymous complaints. All complaints need to be sent by person who is willing to identify themselves publicly. Ratings accountability allows doctors to use real patient feedback to constructively improve their practice. Second, when the doctor rating site receives a complaint against a doctor , this should first be emailed to the doctor, who should be given a chance to provide an rebuttal. This is a basic principle of natural justice ! Only when this is done, should the complaint be published, if it still deserves to see the light of day. If not, then unethical doctors can post ( or get their cronies to post) false complaints about other clinics who are in competition with them – and this can set off a slinging match which harms everyone. Unfortunately, not all websites bother to check the authenticity or reliability of these complaints , which means that even if I have 999 happy patients, 1 unhappy patient can spoil my digital reputation. Many online doctor rating sites are of poor quality, and this is hardly surprising. After all, the primary purpose of these sites is to make money for their owners , not to educate patients ! For example, it’s obvious that the purpose behind consumercomplaints.com is to get users to provide only negative reviews about doctors. After all, happy patients will never take the time to visit such a site– it’s only the unhappy and angry ones who will ! This is a problem, because most patients are not sophisticated enough to differentiate between reliable rating sites and unreliable ones. There are many solutions webmasters can implement proactively to help them provide their reader with a better service. Patients need to provide feedback about their doctors – both good and bad ! However, this should be done in a healthy fashion, so that everyone benefits from this feedback ! Firstly, all reviewers have to be identifiable . Not only will this help to stop abusive anonymous complaints from angry patients , it will also prevent doctors from gaming the system by stuffing the sites with false positive reviews. Peer review can be very helpful in sorting sensible complaints from rants – and should be implemented before a negative review is published. Also, webmasters should allow doctors to respond to complaints and provide their point of view, so that the negative reviews are not one-sided and unfair. This is a basic principle of natural justice, which sadly most rating sites still flout. It’s all very well to talk about theory, but we still need to get down to brass tacks. What can you do if you have a negative review on one of these sites ? Don’t take an ostrich in the sand attitude and pretend there’s no problem ! Ignorance is not bliss – and what you don’t know can hurt you because prospective patients are reading all about you . Don’t panic – and don’t get angry either. Your first response is going to be one of outrage and you will want to sue the person who posted the review – or the website publisher. I am a good doctor who works hard – how dare he write this about me ! This is not a good idea and will just make a bad situation worse . Remember that every patient is entitled to their own opinion – and it’s humanly impossible for a doctor to keep all his patients happy ! Swallow your pride and read the review carefully. Is there some truth in it ? If so, please respond to the review by thanking the reviewer for bringing this problem to your attention; and then described how you’ve fixed it. Patients are not naïve – and others who read the negative review and then your thoughtful comment will be pleased that you are responsive and responsible ! If there’s no truth in the claim, please point this out in your response; and explain why. It’s also a good idea to ask some of your net- savvy patients who are happy with you to post positive reviews. These can often help provide a more balanced perspective; and undo some of the damage. You can provide your patients with clear, written instructions and request them to rate you online. This will help to dilute the impact of the few negative reviews you may have. Encouraging satisfied patients to post positive reviews about you and your practice should easily drown out the occasional dissenting comment. A recent study from the Journal of General Internal Medicine last year that showed that close to 90% of online physician ratings were, in fact, positive. There are still very few India-specific sites as yet. However, this will change quickly as more Indians get online – and sites like Justdial.com do allow user reviews even now. The good news is that these doctor rating sites can actually help doctors to become more patient-centric ! Hopefully, we will start treating our patients better, because we know they can harm our reputation by going online and posting negative reviews. Reading the patient feedback stories at doctor rating sites is a good idea for all doctors , because it will educate you as to what patients want from their doctors ! The good news is that what patients want from their physicians is not all that different from what good physicians want to offer their patients. Patients are generally not unreasonable, high-maintenance consumers; they simply want doctors who care, will listen, and know what they're doing. By reading the positive ratings, you’ll have role models of good physicians you can try to emulate; and by reading the negative ratings, you’ll learn what to avoid. Smart people learn from other’s mistakes – and you can learn a lot about what a medical encounter feels like from the patient’s perspective by browsing through these websites. They’ll help you become a more empathetic doctor if you are mature enough not to take the negative ratings about you too personally ! In the big picture, these rating sites are a great opportunity for the medical profession. We should embrace this opportunity to be open and transparent with our patients . Medical associations should set up doctor rating sites – this will ensure that the basic information which patients need about a doctor ( clinic location; credentials; professional qualifications and so on) is available. Also, these sites will be comprehensive because they will provide information on all doctors . If these are seen to be fair and frank, patients will be happy to refer to these as an authoritative source of information on doctors, because they can trust them, rather than having to waste hours scouring dozens of unreliable and incomplete sites, which may be biased and unreliable . It’s also a good way of identifying the bad eggs In our profession. The few black sheep in our profession end up giving us all of us a bad name, causing everyone a lot of harm. Even though we know who they are, we often prefer to participate in a conspiracy of silence and to turn a blind eye to their cahoots. Rating systems will allow the truth about these bad apples to come out in the open more quickly, helping with self-regulation of the profession. Thus, the Medical Council could take cognizance of repeated complaints about a doctor, and take action, to prevent problems from flaring up. Our story starts with having done four failed IUI’s and four failed IVF treatments in the UK. We found that the treatment in the UK was very impersonal, we felt like a number. We found that any queries we had about our treatment was taking a long time to deal with, answers would have to be chased for. In 2010 we were recommended to go to India for a treatment with Dr Malpani by my brother and sister-in-law, who underwent this process with them successfully a few years ago. We had doubts about the quality of treatment in India , but we kept in touch with Dr Mapani via e-mail. He was very prompt in replying and very understanding. His second opinion about our circumstances was very encouraging and supportive. We arrived in India in November 2011 and started our IVF treatment. We found Dr Malpani’s approach very professional, along with the Nurses who put us at ease and were very friendly. We felt that Dr Malpani wasn’t just trying to take our money but had our best interests at heart. During the treatment we had many concerns and were put at ease by emailing Dr Malpani, who always, no matter how busy he was , had time to answer all our questions. His wife and himself explained all the procedures in detail, so we could understand the process. On day 14 after transfer (two weeks of nervous waiting, but Dr Malpani was only an email away, to deal with all my little concerns). We had the blood test done at the clinic as we were lucky enough to have a month’s holiday. During the first three months of my pregnancy, it was difficult but with the advice of Dr Malpani he put me and my husband at ease. I am now five months pregnant and hoping to do my next IVF for my next baby in India. 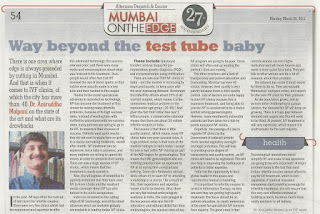 I am also encouraging close friends to do IVF in India with Dr Malpani. What they say about Dr Malpani through the online testimonies are all true. Without their help and support , I would not be pregnant – they have made all my dreams come true. Many infertile women have irregular cycles. While most patients and doctors understand that irregular cycles cause infertility , they are often confused as to how to make the correct diagnosis – and how to treat this common problem. Remember that the reason your periods are irregular is because you do not ovulate. This is called anovulation. Now the commonest reason for this in young women is PCOD. Since common things occur commonly ( and as a medical aphorism states, when you hear hooves you should think of horses rather than zebras), many doctors automatically make a diagnosis of PCOD for every young infertile women they see. Sadly, the eye only sees what the mind knows , and it seems to be a reflex knee-jerk response to diagnose practically every woman with irregular periods as have PCOD in certain parts of the world, such as the Middle East. Nearly all of them are labeled as having PCOD and treated with metformin, just because they are overweight and may have abnormal insulin resistance. Unfortunately, this is often misdiagnosed and overdiagnosed. Not all women with irregular periods have PCOD , which is why it's important that you be well informed to ensure that your doctor is making the right diagnosis for you. There are two sets of tests which can help provide clarity as to what is going on. The first are blood tests to check your ovarian reserve , and these included the AMH level; and the FSH and LH level. Patients with PCOD have high AMH levels; and high LH:FSH ratios. Patients with poor ovarian reserve have exactly the opposite – low AMH levels and high FSH:LH ratios ! An even more reliable test is the vaginal ultrasound scan to check your antral follicle count. This is an extremely easy test to do , but it's important to find an expert to does this reliably . He should provide you with images of your scan in a digital format , so you can review them and send them to a doctor for a second opinion. It's quite easy to count the number of antral follicles when the vaginal ultrasound scan is done reliably. Unfortunately, many doctors are not good at differentiating polycystic ovaries from multicystic ovaries. Just because the patient is obese, they mindlessly label the patient as having PCOD ( even though the ovarian volume is not enlarged; and the stroma is not increased). This misdiagnosis wastes a lot of time and money. Patients with poor ovarian reserve will have a reduced antral count ; whereas those with polycystic ovarian disease will have an increased antral follicle count with increased ovarian volume and increased ovarian stroma. Thus it's quite easy to differentiate between these two possibilities with the help of a well performed vaginal ultrasound scan. What happens if you have irregular periods and don't fall into either of these two categories ? This is possible – and the key in that case is not to waste time trying to make a diagnosis, but rather to focus on treatment. The good news is that it's possible to induce ovulation very effectively , provided your ovarian reserve is normal ! Many infertile couples find going to an infertility specialist quite frustrating. When they go to a doctor, they expect that the doctor will do tests in order to come to a diagnosis ; and then , based on what the diagnosis is, will provide treatment in order to correct the underlying problem. This is a very logical approach , and is the standard model which most doctors use for treating most medical problems. Thus, if you have a low sperm count , you expect that the doctor will do tests in order to find out what the reason for the low sperm count is ; and one he finds the abnormality , he will then provide a solution in order to correct it. If he makes a diagnosis of a varicocele , he will do surgery to treat the varicocele ; or if he finds that you have a low sperm count , he will provide you with medicines in order to increase the sperm count. However, when patients go to infertility specialist , they find that this is not the approach which most of them take . Most infertility specialists will use a success oriented approach rather than a problem oriented approach , which means that rather than focus on problems , we will spend time trying to find solutions in order to bypass those problems. This is simply because our technology for being able to bypass problems after identifying them is far better than our technology is to be able to treat those underlying problems. This is why a lot of infertility specialists will suggest IVF treatment for patients with a low sperm count – IVF allows us to do in the lab what is not happening naturally the bedroom. From an infertility specialists point of view, this is a perfectly satisfactory solution. After all , the patient does not come for treatment of a low sperm count - he comes because he wants to have a baby ! If we can provide him with a baby, how does it matter what solution we use , as long as he is able to complete his family ? However, while this may seem a perfect reasonable solution from the doctor’s perspective, this is often extremely unsatisfactory from the patient's point of view. For one thing , IVF treatment is an extremely expensive exercise - and since the success rate is not 100 percent , this means patients end up spending a lot of time money and energy in pursuing this treatment in order to have a baby. A lot of patients also don't just have financial concerns. They would much rather adopt a natural solution to their problem , and want doctors who will treat the underlying cause, so they can make a baby themselves in their bedroom. This is why there are so many patients who waste so much money taking herbal medicines to improve a low sperm count; or pursue ineffective options such as Felopio and clear passage therapy in order to open their blocked tubes, rather than do IVF. While it's true that some patients have a nagging suspicion that IVF specialists are very liberal in advising IVF treatment because it's much more financially remunerative for the IVF specialist to do so, this is not the real reason. While it’s true that a man with a hammer in his hand will only see nails, patients need to have realistic expectations and accept the fact that reproductive technology still has a long way to go as far as being able to make a reliable diagnosis as to the underlying cause for problems such as a low sperm count. Band-Aid solutions such as IVF will still be the best option for quite a few years, until a lot more basic research is done in order to identify what goes wrong in the testes of men with low sperm counts. The biggest problem for young doctors who have just started practice is – How do I get patients to come to me ? This is extremely hard to do because most patients would rather go to a more established senior doctor who has a good reputation , rather than the new kid on the block. This means that even though you may be extremely technically competent and qualified , you may just be sitting and twiddling your thumbs because patients don’t know about you. This can cause a lot of heartburn , and is one of the reasons why so many young doctors are willing to give cuts and kickbacks to family physicians , to induce them to refer patients to them. Not only is this an unethical ( and illegal) practice , it's also one which causes a lot of damage to you. Once you start giving kickbacks , you can never stop . You are effectively signing away about 50 percent of your lifetime income over to the referring doctor. When you consider that taxes will take away another 35 percent, what will you live on ? Not only is giving kickbacks bad for your morale and self-esteem, it’s a mug’s game because it's easy for the referring doctor to keep on squeezing you even further as time goes by. Thus, if the GP is now charging you 50 percent as a kickback , there is nothing to stop him from charging 60 percent tomorrow, because a new doctor has started practice just down the road, and is willing to offer him that much more. Kickbacks do not create any loyalty - and the referring doctor is always in control because he can create a bidding war which you can never win. Life used to be much simpler in the past , when family physicians would respect specialists , and would refer patients to the specialist who had the most expertise and competence in a particular area. No one gave kickbacks in those days, and the focus was on healing the patient. Today, family physicians do not respect specialists any more . After all, how can you respect anyone who is willing to take a kickback ? Specialists have become a commodity, and one specialist can easily be replaced by another ( if the incentive is right). There's no point complaining about the declining state of ethics today. You have to face up to reality and deal with it. The good news is that there are success stories - smart specialists , who have created a brand name for themselves, and no longer have to depend upon a GP for referrals. You need to learn from them! Rather than depend upon a family physician to refer patients to you, you need to think of alternative options. Let's stop for a minute and think about why referrals from family physicians are so important . It all boils down to a question of trust. Because patients trust their family physician , they will accept a referral from him with the hope ( which is perhaps exceptionally naive these days) that their GP will send them to the best possible specialist. Patients need to be able to trust a specialist before they will go to him . Since they already have an existing relationship with their GP and trust him, they are happy to transfer their trust to the specialist to whom the GP refers them to. However, this is a broken model for many reasons. For one thing lots of families don't even have family physicians these days , because general practitioners have become a dying breed. Secondly , lots of patients are aware of the kickback system within the medical profession, which is why they don't trust referrals from GPs anymore these days. So what do patients do when they are looking for a specialist? Some of them will go to the local corporate hospital because this has an established brand name , and they feel that they will be able to trust the specialist who works in that particular hospital. Many will ask either a friend or a family member for a referral to a specialist. Again, this boils down to a question of trust - and because they trust their friends and family members , they are happy to accept the recommendation of a referral from them. So the question which arises is simple – how can a new doctor get patients to trust him? Bridging the trust gap is not a simple matter of spending money on advertising. It takes time for patients to trust a doctor, which is why it takes time to build a word-of-mouth reputation. A quicker way of building trust in the community is to go online – which is where all the patients are anyway ! The best way of doing this is to create a website which provides a lot of information about the particular medical problem in which you specialize. If you take the time and trouble to educate your patients , you will automatically be perceived as being the expert in that particular area. If patients trust your expertise, they will be happy to come to you for their medical care. Most patients are online these days. They will use the Internet in order to find out more information about their medical problem - and while they are online, they will also look for second opinions . Most patients need reassurance that their doctor it providing them with the right advice and that they are on the right track. If you create a website which is not about you but about the patient’s medical problem, and are happy to share this information with your patients , they will be able to trust the fact that you are an expert in this field , and will be much more likely to come to you for their treatment. Everyone is moving online these days - to buy books ; choose a restaurant ; or book airline ticket. Patients have moved online as well, and it's high time doctors realized that the best way for you to earn your patient's trust is to invest in a website, which educates your patients. Your patients will be grateful to you for sharing your expertise and empowering them with Information Therapy ! The one news source I used to respect was the Economist. It's well written - and , if you make allowances for their biases, a reliable source of news, which covered the entire globe . I believed they did their research thoroughly , and could be trusted. However, a recent article by Schumpeter has caused me to rethink my views. In this article, he talks about the Kahn academy, when he actually means the Khan academy. Now it's true that sexcapades are more interesting that academics, but it's hard to forgive a newspaper , which prides itself on accuracy, when they prove to be so clueless about a modern internet success story which is helping to change the way we teach and learn. I just finished doing a consultation for a patient who been referred to me by a general practitioner. I had spent about 35 minutes , explaining to her that she needed IVF treatment ; and what this would entail. She was a chartered accountant and had a good grasp of the situation and understood the pros and cons of the procedure. At the end of the consultation, she made a request - Doctor , could you please talk to my general practitioner and explained your advice to him. I was a little taken back at this request. We take pride in making sure that our patients are well informed about their treatment because we think we are answerable to our patients and they need an in-depth understanding of what the treatment entails. This is why we spend so much time in educating and counseling , so they know exactly what's happening. While I will write a thank you letter to the referring doctor so that he knows what I'm planning to do and is in the loop, I usually prefer not talking to the doctor who has referred the patient to me. Now it's not that I'm antisocial or that I'm rude – it’s just that I feel that when one doctor talks to another , sometimes the patient gets left out of the loop. This is why I prefer explaining to the patient exactly what I'm going to do; and then documenting this advise in a file , which we give to the patient. I request the patient to go back to the referring doctor , so that she can then discuss my advice with her. I feel this is a better method, because it ensures that the patient really does understand exactly what I told her . This is actually a far better way of improving doctor-patient communication. This method is better for the patient because the patient is the one who's the repository of information. It's also good for the general practitioner because then the referring doctor is confident that the patient has a clear understanding of the problem ; and that I have done a good job explaining to her as to what's involved. This method ensures that everyone is on the same page and that the patient is actively engaged in her treatment ! We got married in Jan 2003 and came to know around June 2006 that we were not able to achieve parenthood due to me having a status of azoospermia. We both were quite okay with the diagnosis and were more worried about how the family would react to it. As expected my mom went hyper. I was glad that the problem was with me and not my wife as that would have been more difficult to handle within the family. We were okay with our status however due to frequent pestering of the elders we consulted an infertility specialist who directed us to an andrologist, who in a 15 minute procedure declared that there are enough jumping sperms in my testicles and I can become a father. We underwent our first IVF procedure in March 2008, without success, mainly the problem was on our side, as both of us were not mentally prepared to becoming parents and the drive had more been from the parents than self. In Jan 2011 we started doing a survey on who would be the infertility specialist that we should approach , after doing rounds of a couple of renowned hospitals in Mumbai, we consulted Dr.Malpani, we liked his practical normal approach and were also motivated this time around. However the best part for us was we both were taking it in steps than worrying for the results and were ready to give our time. Our appointment with the doctor usually was after a dating session ,wherein we would go out for lunch then meet up with the doctor and do a little walking either at Colaba or Marine Drive. It was always pleasant to meet the doctor, who tried hard to coach us on the medical status , progress and the procedure being followed which was very systematically and explained in detail to us. On our each visit , individual attention was given by the doctor, and in the first round itself inspite of some glitches my wife was successful in producing around 18 eggs . We did PESA-ICSI and 16 good healthy embryos were formed. These were frozen; and the transfer was deferred to reduce the risk of OHSS. The doctor asked us to wait for my wife to get back to normal and after two months in June 2011 four of the healthy embryos were transferred after thawing them. The results were awaited and the doctor had asked us to behave normally so my wife was going to work during that time too. However as the days for the results were nearing we were becoming tensed and rather than sitting at home, we went out for outings. The results came and it was positive, initially it was two sacs that were being shown in the scan report, however after two weeks it came down to one which was growing normally. We really appreciate Dr.Malpani’s patience in explaining us the procedure, the methodological approach which resulted us we being the parents of a healthy baby. We have another 12 frozen embryos in storage; and plan to go back after 2 years to complete our family ! Our sincere thanks to Dr.Malpani , his wife and his entire nursing staff. We are a doctor couple ourselves who had undergone treatment in so called best infertility centres in Jaipur,Hyderabad & Chennai without any success.All of them asked us to adopt a child. Finally we approached Dr Malpani and we found him to be really different in his approach which was individualistic and tailormade for the couple. His team made us very comfortable and I knew instantly that we reached the right place. Dr Malpani is very passionate about his field and works really hard to see that each couple taking his treatment succeeds.We were lucky that in first cycle itself we were blessed with a child. We wish we had come to him earlier & I would advise all such distressed infertile couple to carefully select their infertility experts to prevent wastage of time & money. I wish Dr Malpani all the best in his life and pray to GOD to cure all infertile couples approaching Dr Malpani with a child just as we were blessed." More is not always better ! This is a great article , which reminds of this basic fact.
" The truth is, the fastest way to get heart disease, autism, glaucoma, diabetes, vascular problems, osteoporosis or cancer ... is to be screened for it. In other words, the problem is overdiagnosis and overtreatment. This process doesn’t promote health; it promotes disease. People suffer from more anxiety about their health, from drug side effects, from complications of surgery. A few die. And remember: these people felt fine when they entered the health care system. " I am very impressed by how intelligent my patients are ! I received this very thoughtful article from a reader on my blog ( who still insists on remaining Anonymous). I am going to call her Expert Patient. What's fascinating about her article is that it's well written; free of jargon; easy to understand ; and full of reliable information. This just shows that patients can write much better medical articles than doctors ! What does scientific research say about improving oocyte/egg quality? 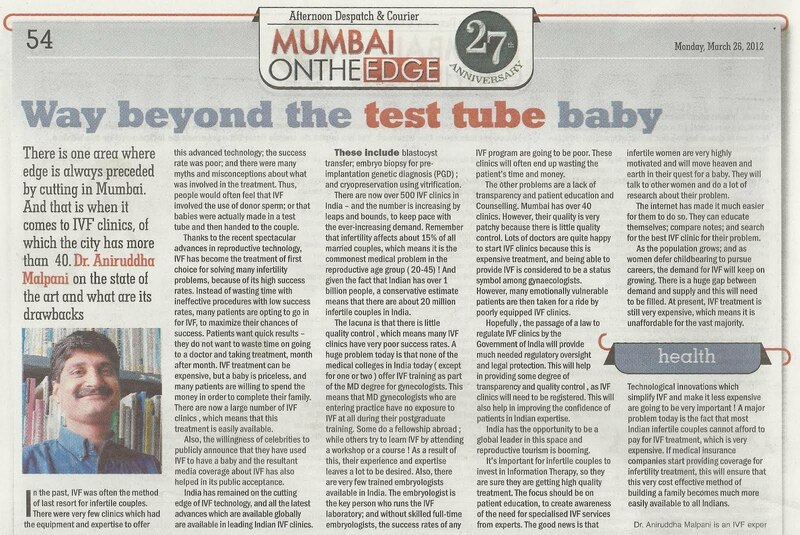 Oocyte quality is the most important determinant of IVF success. As a result of aging more chromosomal and spindle abnormalities accumulate in oocytes leading to increased incidence of infertility, foetal loss and birth defects like trisomy 21 or Down syndrome. Eggs obtained from younger woman carry less genetic abnormalities and hence have higher chance of implanting and becoming a healthy baby. This is evident by the fact that women even after their menopause are able to get pregnant and carry the baby to term using donor eggs obtained from younger women. When a woman undergoing IVF faces repeated failure, naturally the issue of egg quality crops up in the mind of infertility specialist and the patient. Unfortunately even after dramatic improvement in ART techniques, there is no sure way of saying whether an egg is competent enough (without genetic abnormalities) to produce an embryo which will subsequently implant and produce a baby. Although embryologists are able to select good embryos by observing their morphology under the microscope it doesn’t guarantee that the embryos are without abnormalities. A beautiful looking embryo of an older woman has more chance of being genetically defective than that of a younger woman. As a result older women as well as younger women who undergo repeated IVF failures are desperately searching for ways which would increase their egg quality and give them their most wanted wish-a baby! Infertility bulletin boards are filled with women who are determined to find a cure for their bad quality eggs. DHEA, metformin, melatonin, myo-inositol, wheat grass, anti-oxidants, fish oil, co-enzyme Q10, vitamins, especially vitamin D and other nutritional supplements are now-a-days extensively used by women to improve egg quality. Some of these substances used have scientific proof but some not. Selling supplements to improve egg quality is growing into huge market as many businessmen try to make cash of our desperate mindset of having a baby. This led me to screen the scientific literature to find out what does science say really! Most of the experiments concerning oocyte quality are conducted in mice as it is difficult to do such experiments in humans for a number of reasons. This section is the most interesting part of this article. I found a very high quality publication on this topic and this is means it is more reliable. Calorie restriction in the absence of malnutrition is found to slow down the aging process and extend lifespan. If calorie restriction can slow down the aging process of somatic cells does it has the ability to slow down oocyte aging too? The research says YES. Recently a publication in PNAS, which is a, reputed, high-ranked journal, showed that calorie restriction showed striking beneficial effects on chromosomal, spindle and mitochondrial dynamics in mature oocytes of adult female mice at ages normally associated with poor reproductive parameters. The study said that calorie restriction vastly improved fertility in aged animals. When initiated during adulthood calorie restriction significantly extended reproductive lifespan and increased the survival rate of offsprings conceived by aging females. This study clearly states that old age induced oocyte aneuploidy and spindle defects can be safely circumvented using calorie restriction (PMID:21730149). The study is well-designed and very promising. Rhesus monkey maintained on calorie restriction diet into advanced age showed the same health benefits as in mice. Should I start a calorie restricted diet? Why not? But you should also remember that this study is done in mice. Sometimes animal studies cannot be translated to humans. Please remember to take a good nutritional supplement (especially folic acid and iron) when you are on a calorie restricted diet. Our ancestors are wise enough to starve themselves (do a fast) atleast once a week. Calorie restriction comes with an added benefit, who wouldn’t love to look younger than their real age!!! Metformin is a calorie restriction mimetic. It induces a dietary restriction like state (PMID: 20090912). It extends life span and is considered to be an anti-aging drug. It possesses anti-tumour properties. It activates genes which are induced during calorie restriction. So if calorie restriction preserves oocyte quality metformin can also do it! Hyperinsulinemic conditions are detrimental for oocyte quality. Metformin is found to reduce insulin levels by decreasing insulin resistance and hence increasing egg quality of women suffering with PCOD. Are you diagnosed with PCOD? Do you have insulin resistance? Are you having poor egg quality because of PCOD? Metformin is for you. Do you have diminished ovarian reserve? Are you struggling to produce enough eggs? Then metformin is not for you. Metformin is known to reduce antral follicle count and when you are undergoing IVF number of eggs collected matters too! A search for vitamin D and oocyte quality did not give any appropriate pubmed result. I am sure many publications will come in future on this topic. But searching for vitamin D and fertility gave some interesting information. Human sperms express vitamin D. Serum concentration of vitamin D is positively associated with sperm motility (PMID: 21427118). It is also found to regulate a large number of genes in reproductive tissue (PMID: 22047005). Animal data show that low vitamin D status is connected with impaired fertility, endometriosis and polycystic ovary syndrome (PMID: 10232622). Are you living in a country where winter is harsh and there is very less sunlight? It is advisable to take vitamin D supplements. There is lot of contradictions regarding safe vitamin D dosage. According to the new guidelines the tolerable upper limit is 4000 IU for ages 9 and above. Vitamin D at very high doses is found to cause calcification of soft tissues including brain tissue and several other complications. Published cases of toxicity, for which serum levels and dose are known, all involve intake of ≥ 40000 IU (1000 mcg) per day (search in google for Vitamin D Council for further information). In summary are you living in a country where you get ample sunlight? Then just roam around with no sunscreen and expose your skin to sun’s rays. Exposure to sun rays for 10 minutes will help your body synthesize 10,000 IU of vitamin D. You can do this without the fear of vitamin D toxicity because you skin has a built in mechanism to prevent vitamin D toxicity. Take vitamin D supplements if you live in a country where there are very less sunny days and monitor your serum vitamin D levels at appropriate intervals. Why not? Both melatonin and myo-inositol are naturally synthesized in our body and supplementing them won’t be a bad idea (but please read about the side-effects of melatonin supplementation). But better way is to optimize your health and get sound sleep. I am sure most of you will be aware of DHEA. If you google you will find lots of information about DHEA. Please visit CHR (Center for Human Reproduction) website for further details. DHEA was found to increase oocyte production (PMID: 16169414). The mechanism behind it is not so clear. DHEA is used in mice to induce PCOS phenotype in previously normal ovaries (PMID: 16514202). DHEA supplementation was also shown to decrease embryo aneuploidy (genetic defects) (PMID: 21067609). I have seen women who swear on DHEA for their IVF success. Many women even achieved natural pregnancies after taking DHEA. Will DHEA work for me? It might work. It worked for many but we should not also forget that it didn’t work for so many others. I am not trying to be negative, just trying to be cautiously optimistic. Try to monitor your thyroid levels and insulin levels when on DHEA (as it is found to affect both either in a positive or negative manner). Please remember that it is a steroid hormone and it is wise to be safe than sorry! Oxidative stress contributes to somatic aging and it is also implicated in reproductive aging. So experiments were done to see whether using anti-oxidants improve egg quality and reproductive parameters. The researchers supplemented mice with pharmacological doses of vitamin C and E (both are well-known antioxidants) during their early or late life. They found that administration of oral anti-oxidants counteracted the negative effects of female aging on oocyte number and quality (PMID: 11835584). Good news right! Please do not rush to the pharmacy. Their research finding is not yet complete! Even though they found a positive effect of these supplements on the oocyte level they also found that oral administration of pharmacological doses of vitamin C and E reduced reproductive fitness and impaired ovarian and uterine function of female mice. They also said that the antioxidant diet decreased the frequency of litters, litter size, total number of offspring born and survival of male pups to weaning (PMID:12054212). Shocking or? A very recent publication suggested that, when mice are given low concentration of N-acetyl-L-cysteine the quality of fertilized oocytes and early embryo development improved. It also improved the quality of oocytes in older mice (PMID: 22357770). Now the question is how seriously we should take these experiments? First we should keep in mind that these experiments are performed in mice. The next thing to remember is ‘nothing equals a good diet’. Do you feel that you are not able to eat enough vegetables and fruits a day? Is your medical condition preventing you from getting appropriate amounts of nutrition from your diet? Supplementing with a good vitamin pill is a nice thing to do. Otherwise the best way is to add colour to your life by eating different coloured vegetables and fruits. Remember darker their colour more is the anti-oxidant content in them. Does lowering FSH and increasing AMH help me if I have poor egg quality? FSH and AMH help to determine our ovarian reserve and not egg quality. But as you age both egg quantity and egg quality starts to decrease simultaneously. This does not mean that egg quantity and quality are related. I think egg quantity and quality are two different events which has no connection to each other. This can be substantiated by the fact that younger women with diminished ovarian reserve are more likely to get pregnant and carry the baby to term even though they produce less amount of eggs during IVF stimulation. On the other hand older women with low ovarian reserve are less likely to conceive. So both FSH and AMH should be just looked as markers for poor ovarian reserve and nothing more. This can be understood if the actual modes of action of these two hormones are studied in detail. Egg quality is something to do with our genetic machinery which has no connection to these two hormones. Decreasing FSH or increasing AMH is also less likely to increase follicle numbers. Actually increasing AMH artificially can bring down your antral follicle count. These are some of the important scientific information which every woman undergoing multiple IVFs should understand. I wish this will reduce their tension about what supplements to take and what not to take, what is realistic and what is not. But at the end if you think taking certain supplements (because your friend took a supplement and fell pregnant miraculously!) increases your confidence level go ahead and take it, provided it should be from a reliable pharmaceutical company. You should also know for sure that the particular supplement does not have any negative side-effects that will compromise your health. Good luck for every woman who is searching for that single good egg which will make their dream come true!